There’s no question that building great inbound links to your site is hard work. While many site owners resort to spamming blog comment sections to get their backlinks, that’s neither necessary, nor effective for your SEO efforts. But it's probably just a last-ditch effort since, although there's much talk about generating inbound links, the nitty-gritty ways to actually do that are rarely discussed. But link building strategies aren't as tough to implement as many people say they are. Think of it like social media -- if you’re a source of great content and you get it in front of the right people, they’re going to share it. With that in mind, we'll get you started with 33 ideas to help you build legitimate inbound links. Read on to see how to use these link building tools in your SEO strategy. Maintain a steady blog with great content. Link to other blogs on your blog. Curate and publish helpful resource lists. Do expert roundups to build relationships. Create case studies about your most impressive clients. Volunteer to be the subject of a case study. Conduct free webinars and post archived copies online. Create other forms of visual content. Write press releases about interesting company news. Send out a joint press release when your news involves another company. Do some outreach when you have big news or a great piece of content. Set up press request alerts and look for opportunities to send quotes. Write and pitch op-ed articles. Partner with companies in complementary industries. Make friends with other webmasters in real life. Search for and monitor mentions of your brand. Search for and monitor your competitors' backlinks. Incorporate "Tweet This" links into your content. Sponsor or speak at an event. Help another webmaster fix an error on their site. Give away free trials and sneak-peeks of your product. What Are Backlinks / Inbound Links? Backlinks, or inbound links, are a form of off-page SEO where you earn links from other websites that direct readers to your own site. The person receiving the link is one the who refers to a link as a backlink. For example, here's a backlink to our co-founder Dharmesh Shah's blog. Shah could say, "I received a backlink from HubSpot." Backlinks (i.e., inbound links) are different from outbound links (links from your website to another website) and internal links (links from one website to another page on that same website). You can learn more about the differences between all three link types here. They can drive traffic to your website. If someone posts a backlink to your website on their website or blog, their readers might click on it -- and you'll benefit from that referral traffic. For example, many of you who clicked the link to Shah's blog up there may not have visited his blog otherwise. They can help you rank higher in search. 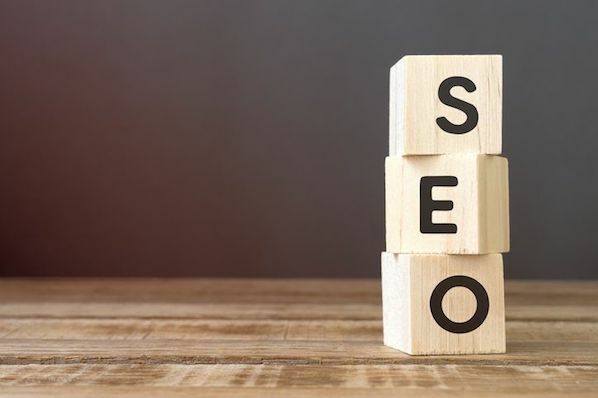 Backlinks tell search engines that your website is an authority on a certain subject -- so the more backlinks you earn from high-quality, high-authority sites, the better your website will rank in search engine results pages (SERPs). A good inbound link comes from an authoritative website, and uses natural anchor text. Anchor text is simply the text copy that's hyperlinked, like this (the anchor text there is "like this"). Natural anchor text means you're not just hyperlinking keywords left and right. Google understands the context of a link, so more generic "learn more" and "click here" anchor text can be just as valuable as keyword-optimized anchor text. 1. Maintain a steady blog with great content. Consistently creating great blog content that people naturally want to link to is one of the most tried and true ways to organically generate inbound links. 2. Link to other blogs on your blog. A blog is meant to be a social tool. The more you link to others -- especially when you do it in a consistent, opportunity-driven way -- the greater likelihood one of those bloggers will return the favor. Plus, you can't cover everything about everything on your blog. It makes sense to leverage the wealth of resources on the web to make your blog's experience better and more rewarding for your readers. 3. Write guest blog posts. Write a great blog post, and shop it around to blogs it'd be a good fit for. If one accepts, they should be willing to give you an inbound link in the post. Don't know whom to write for? Most media outlets allow people to submit original articles on topics relevant to their readership. Here are guest blogging instructions and guidelines for 11 top media outlets, including The New York Times, Business Insider, HBR.org, Mashable, and more. 4. Curate and publish helpful resource lists. Resource lists are both great link bait and helpful content for your readers. If you create a comprehensive resource list, it'll be easy for other bloggers to link to it in their own posts instead of rehashing and curating all that content themselves. To give you an idea of what one might look like, here's an example of a list we curated for free content creation tools and resources. 5. Do expert roundups to build relationships. Expert roundups can be a great tool for building relationships with influencers. While these roundups may not get you a lot of inbound links or leads right away, building relationships with influencers will help you get solid backlinks from authoritative sources down the line. After they contribute to your roundup, you can reach out to them later to ask about a guest post opportunity or something else -- while thanking them again for contributing to the previous expert roundup. Here's an example of an expert roundup we did, where we reached out to successful marketers and asked them how they got started. Newsjacking is when you capitalize on the popularity of a news story to amplify your own sales and marketing success. If you're the first blogger to comment on a news event, you'll rise to the top of the SERPs due to the "freshness" component of Google's algorithm, and others will link to your content in their own accounts of the story. Read this blog post for four newsjack formulas to get you started. 7. Create case studies about your most impressive clients. If you make your clients look good in case studies about their business, you can bet they'll be linking to your site. But you've got to make them good. This means choosing companies that have seen the best results, are enthusiastic, and know your product or service well. It also means asking the right questions and laying out the case study in an attractive, comprehensive way. Here's a free case study template to get you started. 8. Volunteer to be the subject of a case study. Why not get on the other side of the case study link love? We're always looking for customers who are willing to be the subject of a case study. Volunteer your time for one of your major vendors, and get a backlink from the case study once it's published. ... And promise to share the data with others. If you do the data collection and crunching and give some high authority sites access to the findings afterwards, you can bet they'll do some promotion and inbound linking for you to make sure you have a great sample size. Download this free guide for how to use online surveys in your marketing. If you provide a comprehensive review about another author's content, there's a good chance they (and others) will link to it. Here's an example of a book review from InsightSquared's blog, which sums up The Challenger Sale in what they promise is an eight-minute read or less. 11. Conduct free webinars, and post archived copies online. If it’s informative, your attendees will absolutely share it. One easy way to do this is to turn your PowerPoint presentation slides into a SlideShare presentation, and then embed that presentation into a blog post. You can also embed it into the webinar's landing page so that anyone looking to sign up for a webinar that's already over can check out the presentation. Remember when I talked about curating and publishing resource lists for your blog in #4? What do you think people include and link to on those resource lists? Free tools are a big one. You can get on the other side of those resource lists by creating free tools that are really helpful for your target customers. Here at HubSpot, for example, we created Website Grader, a tool to which many agencies, partners, and others in our industry link. Like free tools, templates are another thing people will find useful enough to link to. Before you create a template, think about what kind of templates would make people's jobs easier. A designer, for example, might create a library of downloadable business card templates to which others could link over and over. Bookmarkable content is often the kind of content that gets tons of inbound links. People absolutely love to share infographics. If you create an original infographic yourself, people will link back to you as the original source. To increase the likelihood of an inbound link, you might also share your design with the sources you cited, and make the embed code for your infographic easily accessible. Not a designer? Anyone can create professional-looking, high-quality infographics -- and quickly with templates like these 15 free infographic templates. If you want to learn how to create an infographic in under an hour using those templates, read this blog post. 15. Create other forms of visual content. Remember that cartoons, content visualizations, charts and graphs, and the like are extremely popular as people become more and more visual. Plus, they take a little time and money to make, so if you've done the legwork, others will probably skip the fuss of creating their own visual content and link to yours instead. Here's a list of 29 free online design tools so you can create your own graphics, regardless of how tech-savvy you are. Slice one of your infographics into pieces, or repurpose one from your last speaking gig. You can put these up on your blog, in your website's resource center, or even on a SlideShare account for more links. Keep in mind that the most shareable presentations are the ones that are the most compelling. That means great content and great design. Read this blog post for a start-to-finish guide on nailing your next PowerPoint presentation. 18. Write press releases about interesting company news. By turning your PR strategy into an inbound one, you create opportunities that weren’t there before and carve out a place for your company, building meaningful mindshare in the process with your target audiences. Once you write a great press release, post it up on your website and then push out your releases to one of the big newswires to get more coverage. 19. Send out a joint press release when your news involves another company. This can help reach thousands of other related sites that, in a press release about just your company, may not have linked to your site. 20. Do some outreach when you have big news or a great piece of content. Gaining attention from the press and getting published in industry publications can help you build your brand, increase your visible expertise, improve your credibility, and, of course, get backlinks from authoritative sources. First, create a dedicated page about the story on your website for them to link to as a resource. Then, reach out to a handful of journalists and/or publications that you can see really valuing your story. Be sure you give context to your request, you follow their rules, you write a compelling subject line to your pitch email, and that you're helpful, not boastful. Read this blog post to learn more about pitching your story to journalists (which includes two email templates right in the post). 21. Set up press request alerts and look for opportunities to send quotes. Press request alerts are requests for sources of information from journalists. These journalists are constantly looking for quotes from specific people to feature in their article, and there are several mediums they use to send requests and find those quotes. 22. Write and pitch op-ed articles. If you have an interesting opinion to share and can express it clearly and persuasively in an op-ed article, you could have the opportunity to reach a lot of people, earn recognition for yourself and your organization, and get authoritative backlinks to your website. I find the most effective op-ed articles make a single point, embrace the author's personal voice, and then offer specific recommendations. Once you write the article, target online versions of big newspaper and magazine publications for an extremely valuable inbound link. Here are guest publication instructions and guidelines for 11 top media outlets. 23. Partner with companies in complementary industries. It’s common practice for corporate channel partners to link to each other's great content, because they have a vested interest in one another's success. You might consider assessing how much traffic a partner can drive to your website by taking a look at their overall web presence on Alexa and SimilarWeb. These sites can help get a rough idea of traffic, bounce rates, keywords, and sources people are using to find that site, as well as the next action they take after visiting. Read this blog post for more ways to seek out the best brand partnerships. You can also go a step further and build co-marketing partnerships. This means partnering up with another company to promote a piece of content or product, and then sharing the results of that promotion. When you leverage the relationship and reach of a partner, you'll get more links and more buzz with less work. You can ask users of your product and industry experts or analysts to review new features you're rolling out, for example. Not only will you receive an inbound link, but you'll also get great feedback and strengthen your relationship with those you asked to write reviews. Don't know where to ask for reviews? Check out our list of the best product review websites for B2B and B2C companies. 26. Make friends with other webmasters in real life. Strengthening your relationship with other webmasters will open the door for relevant inbound link requests when future opportunities arise, and make it more likely those requests don't fall on deaf ears. Networking is an unparalleled skill to have. The wider and more open your network, the more opportunities could be unlocked that you didn't even know existed. Here are 10 helpful tips on networking like a pro to get you started. 27. Search for and monitor mentions of your brand. 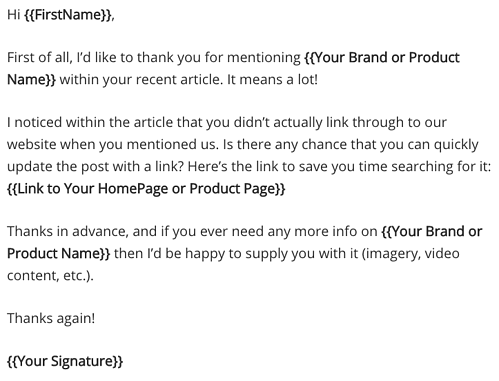 Contact webmasters about turning those mentions into inbound links, but only when it's warranted -- like when they're citing data of yours, for example. This is a tactic called "link reclamation." Monitor brand mentions by setting up alerts using tools like Mention or BuzzSumo, and adding keywords related to your brand or products. Just make sure you exclude any mentions from your own website within the alert, which you can do in these tools' settings. 28. Search for and monitor your competitors' backlinks. Then, find opportunities where you can get similar links. This is a great way to find high-value link opportunities fairly easily. Barby suggests running competitor research like this weekly or monthly to find new opportunities you can take advantage of while they're still fresh. Use a link analysis tool like Ahrefs, Majestic, or Moz's Open Site Explorer to get a list of the backlinks for one of your competitors. Then, check out what types of posts are earning backlinks and benefiting from that off-page SEO. 29. Incorporate "Tweet This" links into your content. Part of getting inbound links is getting your content out to the masses. Including "Tweet This" or "Click to Tweet!" links for tweetable nuggets in your content will get people sharing your content socially more often. The result? Greater visibility in search engines, news feeds, Twitter streams, etc. -- and thus more opportunity for your data to be referenced in other people's content. You can easily create tweetable links using the ClickToTweet service -- without having to learn any custom code. Click here to learn how to generate ClickToTweet links. 30. Install social sharing widgets. Just like "Tweet This" links get your content out there, so do social sharing buttons and widgets. Put them on your marketing content like case studies, whitepapers, ebooks, and blog posts. 31. Sponsor or speak at an event. Events usually give their speakers and sponsors great website publicity. You can also negotiate inbound links into your terms to be sure your time and resources yield a beneficial inbound link. If you're speaking at an event, make a really awesome, shareable presentation that people will want to find, share, and even link to later. Read this blog post for a start-to-finish guide on nailing your next presentation. 32. Help another webmaster fix an error on their site. Remember when I said you should get to know other webmasters? This is another time those connections will come in handy. When you find broken links on others' sites, let them know (politely, of course), and provide them with a piece of your own content that would be a suitable replacement for that broken link. Be personal, friendly, and helpful, and this could be an opportunity to start building a relationship with that webmaster, too. 33. Give away free trials and sneak-peeks of your product. When people get to see your product beforehand, they will want the world to know they're part of the VIP crowd, and might write a review with a link back to your site about it. There are a few ways to give away free trials. You could create some call-to-action buttons for your website or blog. (Here are 50 free, customizable CTA templates to help you out.) You could also send a new product announcement email to folks who you think might be interested, like current customers. For an example of what a good product announcement email looks like, see #1 in this blog post about marketing emails. 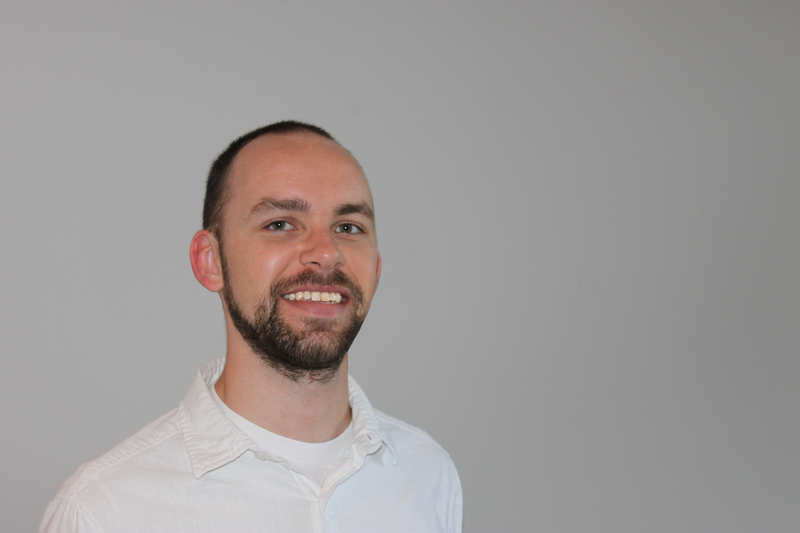 Editor's Note: This is a guest post by Corey Northcutt, who manages a Chicago-based inbound agency: Northcutt. There, he has fact-checked 270+ Google ranking factors and authored a 24-module, 1,200-step checklist for a thorough approach to online marketing. This post was originally published in April 2012 and has been updated for freshness, accuracy, and comprehensiveness.